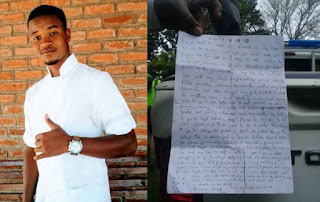 A young man identified as Praise Mfutso, from Malindi Mangochi in Malawi, reportedly hanged himself over poverty in his family as he begged God for forgiveness in his suicide note. The young man who disclosed that he has tried so hard to end poverty in his family to no avail, added that he has been struggling to attend college but got tired because he got no help. Before his death, it was gathered that the deceased was working with a certain NGO PA at St. Martin Mission Hospital in Malindi, Malawi.